Hair salon, Glitterati was launched by Owner and Creative Director Enzo Bertolone. Located in a centre of Weybridge, Glitterati is very popular with the local clientele and already has a strong celebrity following. As the name suggests, the salon, stylists and its therapist follow a philosophy of “Beautiful Hair: Beautiful People” instilling confidence, pride and individual style into all their clients. 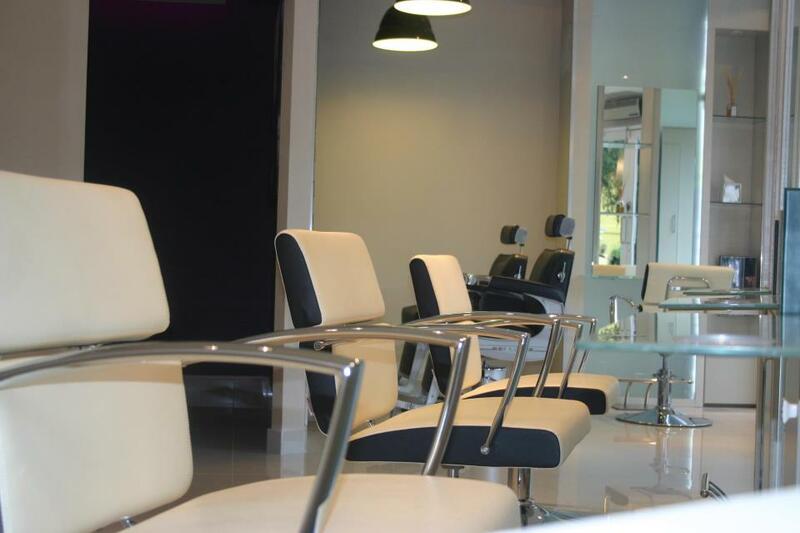 The salon is unique in many ways and could be viewed as a conceptual salon due to the innovative concept of creating a spa-like hair salon to complement the luxury and relaxing atmosphere of the beauty spa. Glitterati Hair and Beauty Salon opens up a whole new world of personalised luxury and indulgence, where you can enjoy anything from a revitalising facial during your lunch hour to the highest standard hair cut and colour service or a complete top to toe makeover for a wedding or special occasion. Education is an important focus at Glitterati, and it is for this reason that the in-salon Academy has recently been launched. With 6 educators (3 cutting, 3 colouring) this “within the salon” Academy not only supports the development of the 16 employees, it has also been popular with local hairdressers and colleges. Experience a whole new world! The Glitterati experience is all about you; being cosseted in our luxurious sound proffed therapy rooms, having time to yourself to relax in our colour lounge, read a book uninterrupted or chat to friends over a glass of wine or Prosecco on our garden terrace. Come and experience the Glitterati magic for yourself - we're looking forward to sharing it with you! I found this salon as I had read about the kerastraight treatment and googled for local salons who offered it. I could not be more pleased, not only with the treatment but also with my haircut and general experience! Enzo was lovely, he understood what I wanted from my terrible description and interpreted it perfectly! He was happy to answer my questions and give advice, and he was really chatty and friendly, as were all the staff. I was offered a drink 3 times and was made to feel extremely welcome. I booked my next appt before leaving the salon and I am looking forward to going back! No smiles, no chat. Really surprised at the other reviews giving such high marks and good reviews. Perhaps I caught them on a bad day. After having hair extensions for years, my hair was a little tired and weak. I was desperate to grow it, but it needed a good cut and some tlc. I saw some of the amazing work Beth had done on Instagram and decided to book in for a hair makeover. I had balayage and a cut and blow dry. The transformation was amazing. The hair colour Beth achieved was very close to the picture I showed her. Beth is a real perfectionist, so I knew I could relax and let the professional do her work (this is normally a challenge for me as I’m a bit of a control freak). The staff and clients are super friendly, had lots of lovely chats and the time flew by, plenty of beverages on offer too. Can’t complain. It was an outstanding experience, resulting in me feeling like a new woman! Megan was very good and did an excellent job with my hair especially my most concern, grey hair. I'll definitely book another appointment with her in the near future. Emily was lovely too and made me comfortable washing my hair. Thank you for a lovely experience from both the girls. +'s Very nice, clean and welcoming Salon. Friendly staff. Good Cut and Blow dry. -'s booked Cut, Blow dry and Fusio dose treatment but fairly sure didn't receive a Fusio dose treatment. As always, the children had fun, loved their hot chocolates, and came out looking far smarter and cooler than when they went in! Thank you Megan :-). I was really pleased with my colour, cut and blow dry by Beth. The whole experience was very lovely and relaxing and Beth clearly knows her stuff when it comes to colour. I am so pleased with the end result. I've been getting my hair done here for a while now and always leave feeling great and receive so many compliments. Great customer service and facilities at the salon. Just had my grown out and dull balyage fixed by Tiffany and so pleased with it. First time for haircut. Very friendly and kistened to what i wanted. Dear Anonymous, thank you for your kind words, we're glad you enjoyed your experience. Looking forward to seeing you again soon. Thank you for your lovely review, looking forward to seeing you again soon. I had my hair cut but was not happy on the length once I got home. I sent them an email requesting it to be done to my liking. They called me back immediately and asked me to come in straight away. They recut my hair to my liking and I am 100% and some more satisfied. Definitely am making glitterati my place to go for my hair. Have recommended my daughter who will be making appointment as well. In my opinion the best salon I have been to in years. Thank you glitterati for taking my insecurities and turning me into a stunner. ???? Thanks for your comment Brandy, lovely to hear you had a great experience and we look forward to seeing you again soon. As always I am more than happy with my hair cut/style. I would definitely recommend Glitterati, and Maria who does my hair. Thanks for your review, nice to hear you had a great experience and we look forward to seeing you again soon. Enzo is a scissor-wielding genius!! Thank you Enzo for giving me the best haircut I've had in a long time! Short fine hair is a pain at the best of times but he knows what to do with it. This is the first time in years that I've walked out of a hair salon not feeling mumsy!!! Beth really listened to what l wanted and translated my wishes into colours to die for, beautifully administered. Maria also really listened to me and produced yet another flattering haircut, beautifully cut and dried... Very, very happy!